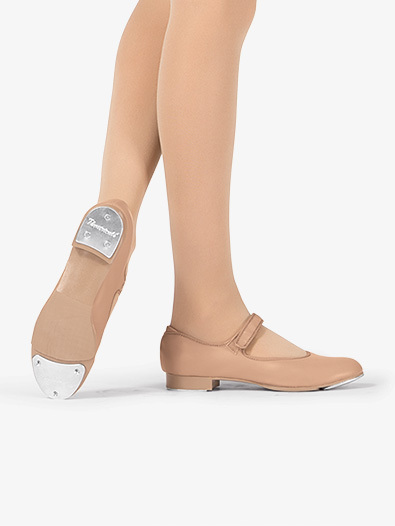 "Mary Jane" style tap shoe features a secure, easy to use hook and loop strap closure, a rubber sole pad for traction and stability, screw-in heel taps, a padded sole for comfort, and a padded heel collar to help prevent blisters and injuries to the Achilles tendon. The black patent features a PVC upper while the tan features a matte PU upper. I bought these for my 3 year old daughter. Her teacher required a different shoe but this was the only one that fit her tiny foot. Great shoe! Plus its Velcro so its super easy to get it on and off! 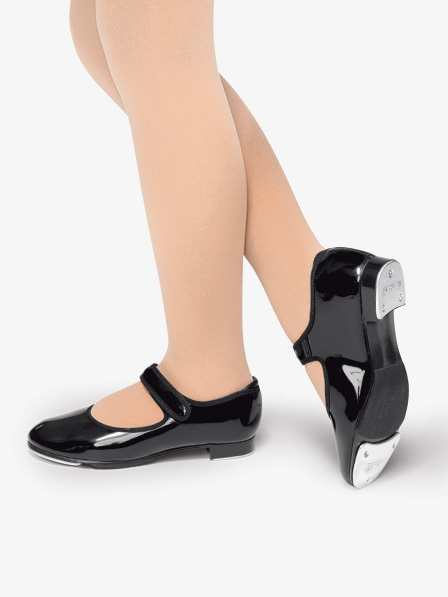 I searched wide width tap shoes and hit this product. Even though I ordered wide of 11.5, it's very narrow. I have other bland (Belera) regular width, and my daughter complained it's stiff, so I was hoping for "wide" size assure more comfort. It turned out Theatricals wide size is much much narrower than Belera's regular width. Having 6 year's old daughter, I've never seen such narrow shoes. Now I need to pay return shipment for such a wrong label. Unless your child has very narrow feet, don't get this product. Waste of return fee. Hello! Thank you for sharing your experience with these shoes. We will address the issue with the manufacturer and make them aware of the sizing discrepancy. One of our Customer Service representatives will contact you to rectify the situation and assist you with finding the right shoes. easy for small children to put on with the Velcro. Just what we needed!! Received order very fast. These were way too small and narrow. My daughter doesn't have a wide foot and she wears a 9-1/2 or 10. I ordered a 10M and she couldn't get her foot in them at all. This is the second pair I have purchased for my three year-old granddaughter. She outgrew the first pair and I didn't hesitate to order new ones just like the first ones. They fit perfectly and are well-made. She loves them so much she won't take them off. I highly recommend this purchase. These are nice looking shoes and appear to be good quality. They do follow street sizing and possibly run a bit large. Up until now, my daughter's tap shoes in general have run really small and I've learned to size up. Don't size up for this one! Her current shoe is size 11 but of a different brand. The size 12 in this shoe measures 19 cm. Is there any where to get a toe to heel length size chart for these? Please refer to the sizing chart. This is the current and only sizing we have on this item. This information is shown as a guide only and not a guarantee. Actual fitting may vary. Do the sizes include Toddler? My daughter is a 12-13T size (not quite yet a 1)... does this shoe come in those sizes? I am not sure if the 12/13 listed is a "Toddler" or larger size. The size 12/13 is larger than a toddler size. The smallest size these come in is a size 6.0, which measures just 5 1/8 inches in length and is considered a toddler size. Do the theatricals Velcro tap shoes run true to size? The suggest fit for these is same as street shoe.